You are here: Home » GUEST BLOGGER: How does my Buddhist practice affect my daily life? On occasion, the blogger of Precious Metal, Nate DeMontigny, coordinates a wonderful event: A Buddhist Blog Swap. 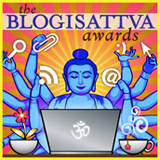 This is an opportunity for digital dharma dialogists to be a guest speaker on other blog. I was very fortunate to have been given J Andy Lambert of Bayou City Buddhist as my guest speaker. My Zen practice never really stops. The bell chimes to end my sitting in the morning. I stand up and I go on with my day, but the sitting doesn’t stop. It gives me a second to breathe, to respond instead of react. Many people don’t really think like I do. As a Zen practictioner and a Unitarian Universalist, I celebrate the diversity of beliefs. There is wisdom to be found in all religious traditions. HH The Dalai Lama once said there are many paths up the mountain. Honestly, I think His Holiness could have simplified by saying all paths are the same path. Many people outside the Buddhist Tradition would not agree with this view, perhaps, but that too, is also delusion. Regardless, I feel like every decision I make ,from the very large and life-changing to the small and seemingly inconsequential, is informed by Practice. I make eating choices based on my practice. I make choices in entertainment based on my practice. I make choices in Association based on practice. The list goes on and on. I don’t think endless form and ceremony is necessary to accept the Middle Way. I take the precepts everyday by living them out. I sit as the Buddha sat everyday. That’s pretty much it.